Next week, the Duke and Duchess of Cambridge will embark on a week-long tour of India and Bhutan. 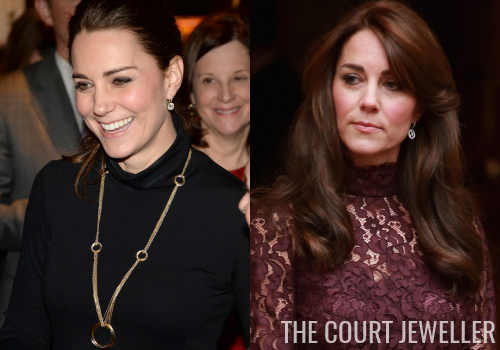 The itinerary has been officially released by Kensington Palace, so it's time to do some guessing about which jewelry we may see Kate wear on the trip! The tour begins in Mumbai on April 10. After they arrive, William and Kate will make their first appearance at the Taj Palace Hotel, the site of the November 2008 terrorist attacks. They will lay a wreath in remembrance of those who perished in the attacks and will meet with staff members who acted heroically on that day. 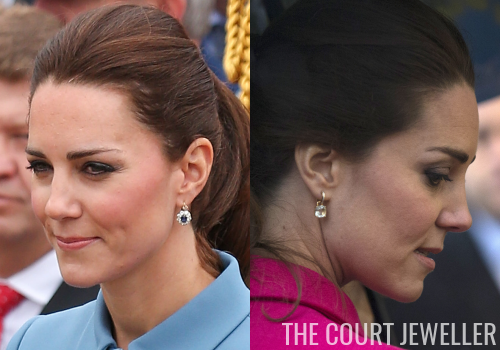 It's not unusual for a Cambridge royal tour to begin with a stop at a place of remembrance, and Kate generally keeps her jewelry appropriately low-key -- usually just a simple pair of earrings. At the Blenheim War Memorial in New Zealand, for example, Kate wore her diamond and sapphire cluster drop earrings with a blue coat. At the World Trade Center Memorial in New York, she wore her Kiki McDonough green amethyst cushion drop earrings. William and Kate will then head to the Oval Maidan, a large public park, to watch young athletes play cricket. They'll reportedly meet and play with local kids during the engagement, so I think it's fair to say that we'll see casual clothes for the event. 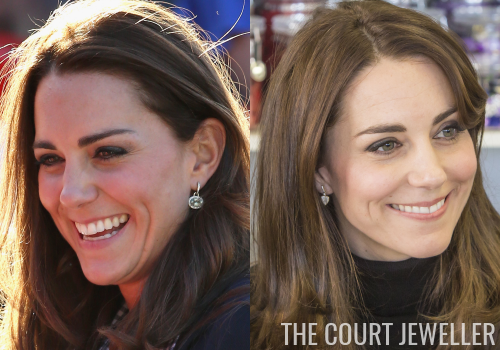 Kate tends to keep her jewelry to simple earrings for "sporty" events as well; quite often we see her in pieces from her growing Kiki McDonough collection. She wore her Kiki McDonough green amethyst oval drop earrings in New Zealand for a rugby-themed engagement. 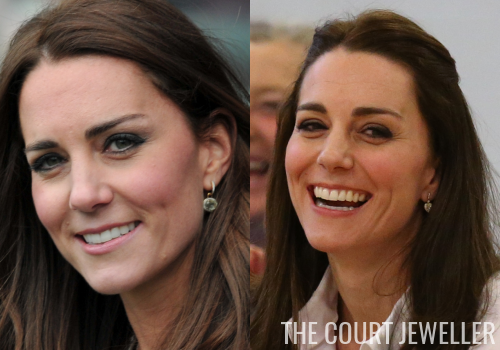 Earlier this year in Scotland, Kate played tennis while wearing her Kiki McDonough "Lauren" earrings. After the cricket match, the couple will travel to the Banganga Water Tank, a part of Mumbai where the city's economic disparities are particularly stark. They'll meet with representatives from a charity dedicated to creating new opportunities for young people. 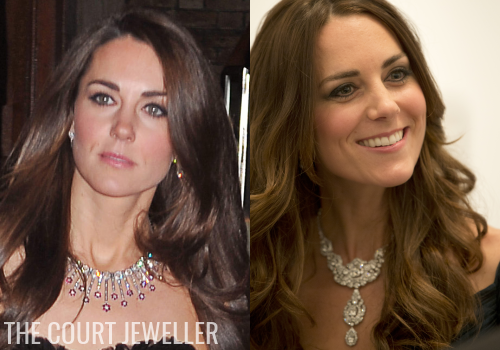 When Kate has an engagement that involves a wardrobe change, she often keeps her jewelry the same. Just after the rugby engagement in New Zealand, for example, she wore the same green amethyst earrings to visit Queenstown. In Edinburgh, she wore the "Lauren" earrings for both the tennis workshop and a visit to an art class. The first day of the tour wraps up with a dinner -- probably our best chance to see a major piece of jewelry on this royal tour. KP describes the event as "a glittering reception and dinner" that will feature Bollywood stars and a red carpet. The reception is jointly hosted by the British High Commission and the British Asian Trust, and it will raise money for various charities. ...so I have high hopes for something very glittery on Kate! It's possible we could see a repeat of an already-worn piece -- something like the diamond and ruby suite by Mouawad, or the Queen's Nizam of Hyderabad Necklace (which, of course, was a gift from an Indian prince!). But I'd also really, really love to see a sparkly surprise at this event. William and Kate have one more engagement in Mumbai before they leave: an event for the GREAT Campaign on the morning of April 11. It's being held at a bar/restaurant and will focus on young entrepreneurs. I imagine this event will be typical of Kate's daytime engagements. To give you a general idea of the jewelry she's worn before at GREAT events: in New York, she wore her Cartier Trinity Necklace with Kiki McDonough's green amethyst cushion drop earrings. In London, she helped host the Chinese president at a GREAT event while wearing her Mappin and Webb Empress earrings. Next, the Cambridges head to New Delhi, where they will begin their visit with a wreath-laying at India Gate, the nation's primary war memorial. Although the visit will remember all of India's fallen soldiers, the engagement is particularly intended to focus on those who fought in World War I, as a part of the recent centenary commemorations. Again, Kate usually keeps it very simple for these events, rarely debuting new or significant pieces, to help keep the focus on the matter at hand. 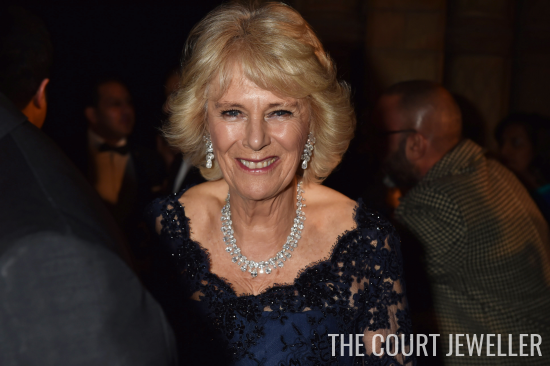 In the past, she's often selected her diamond and sapphire cluster drop earrings or her Annoushka pearl drops for visits to military memorials. 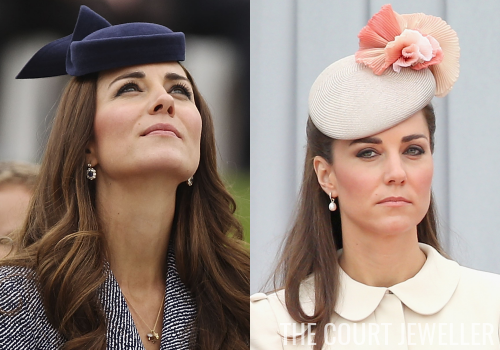 At the Australian War Memorial in 2014, she also wore her delicate Asprey necklace with small woodland charm pendants. Kate and William's next engagement in New Delhi is a visit to the Gandhi Memorial and Museum. I think it's very possible we'll see her repeat the same jewels worn at India Gate. On the evening of April 11, the Cambridges will attend a special garden party at the residence of the British High Commissioner; the event will be a birthday party for Queen Elizabeth II, who turns 90 the following week. William will make a speech in tribute to his grandmother. Several hundred people will reportedly attend the party. 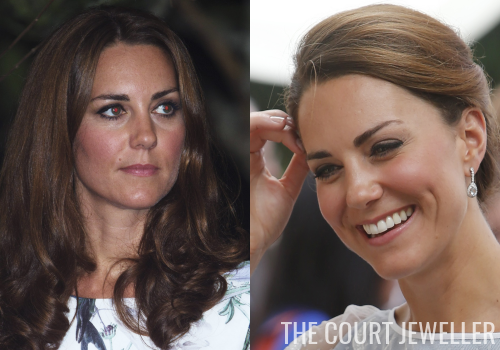 During the 2012 royal tour of Southeast Asia, Kate wore the same earrings -- her diamond and aquamarine pair -- at two different British High Commission receptions. One of them was an evening reception, so it's possible that we'll be looking at jewels of approximately the same scale for this reception. Since the party honors the Queen, I think it's also possible that we'll see Kate pay tribute to her with a brooch (perhaps even one borrowed from the BP vaults). 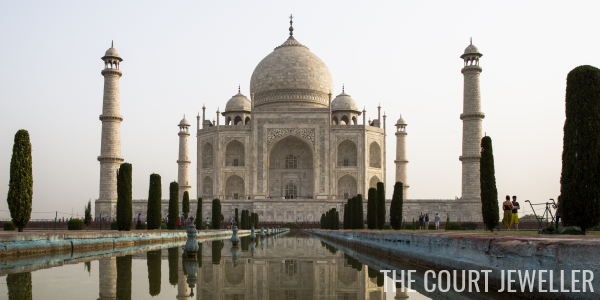 The New Delhi leg of the tour wraps up on the morning of April 12, when William and Kate have two more engagements: one focused on supporting young people, and another that includes a meeting with a government leader. They haven't announced details yet, but I'm guessing this will be another occasion where we'll see Kate in her daytime jewelry "uniform" -- simple earrings, a watch, her rings, and maybe a bracelet. Stay tuned later today for more tour jewel predictions!